During the recent ACI WAGA in Montreal, we sat down with Stephanie Meyn, Climate Protection Program Manager at Seattle-Tacoma International Airport (Sea-Tac) to talk with her about airports, climate protection, carbon emissions and their way of doing things. Thank you for joining us for this. Sea-Tac’s reputation precedes you. You have long been one of the most environmentally ambitious airports in North America - you were the pioneer for the launch of Airport Carbon Accreditation in North America. What drives that? Well, it’s been a big part of our culture for some time and also a very green culture in the city of Seattle. In 2007, we were the first airport in America to undertake a full carbon emission inventory and that’s partly down to the strong leadership we have at the airport, but again the Seattle cultural mindset too. The Port of Seattle Commission to whom we report is very demanding in terms of our environmental credentials. So, we based a lot of our goals on that inventory as a starting point – but it was also a key way to educate the various departments and companies on the airport site. We are now a team of 15 people in the Environment department and Sea-Tac doesn’t look at environment as just a regulatory compliance issue– we want to be at the leading edge. We are constantly looking for the next big idea that can help us lower our environmental impact, across waste, carbon, biodiversity, air quality, land use, water management and more. But in parallel Sea-Tac is now the fastest growing airport in America. And that means that each year, we have millions more passengers, plugging things in, moving bags, needed to be kept cool – all of which increases our energy consumption and we have chosen to measure our emissions in absolute terms, so that means everything we undertake on the environmental side has to be meaningful. How much are you communicating about this to passengers? It’s not something we set out to do in the beginning, but this past year we launched a campaign called ‘Sustainable Insights’, to let passengers and visitors to the airport know a bit more about our approach and how we are reducing our emissions. It’s thematically arranged around the various different environmental activities with different signs and material explaining to passengers what we are doing and how, in a very conversational tone. So, for example, we are currently working with our airlines to switch our entire ground support fleet to electric – so we have signs that say ‘Electric, it’s how we roll’. So that campaign has received a lot of positive feedback on our social media channels – which in turn has been motivating us to do more. We’re now engaged in educating people on the landside area of the airport, about the choices they can make in terms of the emissions impact of the mode of transport they use to get to & from the airport. The aim is really to get more people using public transport. Are you working a bit with schools? We are blessed to have Raisbeck Aviation High School (a STEM school) in Seattle – a High School that is dedicated to aviation and aerospace themes. Now typically, quite a lot of the students are interested in the aeroplane, pilot, or engineering side of things, but we contribute part of the Aviation & Environment module to the curriculum. So within that, each year we present a real-life environmental problem that the airport is facing and we ask them to solve it. The students then create their own consulting teams and they have actually come up with some really good ideas – so it’s a very fruitful engagement – and a relationship that we have come to value a lot. You ‘re at the Optimisation level – one step away from carbon neutrality. Are you aiming for the top? We are, but we want to do it our way. We actually want to do it without purchasing any offsets and that’s a significant challenge, but it matches what the Port Commission has set out in its Century Agenda Goals – namely, to achieve a 50% reduction in absolute GHG emissions. We are working on strategies to get us there. 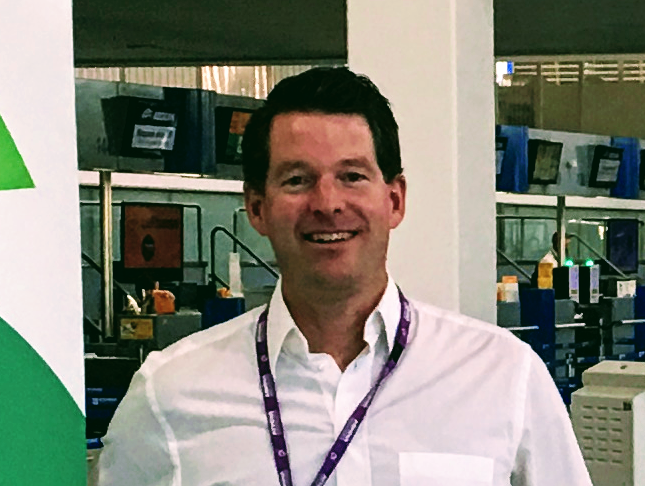 We like that the metric that the 4 stages of Airport Carbon Accreditation have defined and it certainly helps push us to go all the way to the top, but we want to do it in a way that fits with our own culture and ambitions. At Optimisation – are you working with any surprising partners you can tell us about? Last year, we launched a study to integrate aviation biofuels into our infrastructure. This is a project we’re working on with Alaska Airlines and Boeing and the report is due to be released in November, so hopefully there will be more developments to report on that soon. Landside, we have a really good team working with partners there, especially on sustainable transportation. Perhaps the most visible example is probably our aggressive clean taxi programme – all of the taxis picking up at the airport have return an average of at least 45 miles per gallon(a blended highway-city average) or alternatively fueled . One hundred percent of the taxi fleet has to meet that – about 300 vehicles all told, so we now have a majority of hybrid taxis that meet that rule. And that rule includes disruptors like Uber, Lyft and any others who want to serve the airport – they have to meet the equivalent of that standard through the use of passenger pooling, high efficiency vehicles, and minimizing their trips to the airport without a passenger on board. Are you using any green energy? Sea-Tac is a regulated utility, which is quite a rarity among airports in America. Because of that we purchase wholesale 95+ percent carbon-free hydro-electricity, so electricity does not play a large part in our carbon footprint. The majority of our carbon footprint is from the natural gas we use to power our boilers, heat our water and run our buses. However, as I mentioned earlier, we also recognize that we are a growing airport and the Port of Seattle Commission has deemed that all increased loadgrowth/energy demand should be met by conservation and renewables – from 2011 onwards. So we cannot rest on our laurels. That is the cultural expectation. We are currently investigating sources of renewable natural gas and we will soon present our new energy plan – so the next time we meet, then I can tell you all about it! I would have say that the surprising thing about Sea-Tac is the freedom I have to come up with ideas and new solutions to make these ambitions I have talked about here, a reality. But it’s also about the support for the ideas you have – it’s a very “can do” place to work and the culture and team spirit are naturally a big part of that. And actually in that regard, I should say that learning about some of the ways our peers in Airport Carbon Accreditation are reducing their CO2 emissions, is also very useful and inspiring. If you decided to reduce your carbon emissions, how would you go about it?